Knicks legend Earl Monroe loves some heart healthy Zuppa de Pesce. Here's the recipe. For more info, go to Merck Diabetes. 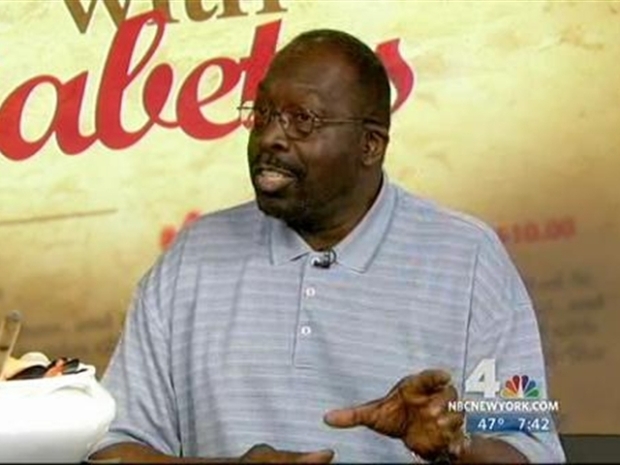 Knicks legend Earl Monroe loves some heart healthy Zuppa de Pesce. Here's the recipe. For more info, go to http://www.MerckDiabetes.com. Millions of people suffer from Type 2 Diabetes and struggle with dining out. Earl Monroe, otherwise known as Earl the Pearl, has some tips. Sautee Spanish onion and garlic in olive oil on low heat. Add the whole tomatoes and stew on low heat for 45 minutes. Puree the stew and season with salt, pepper, fresh basil and oregano. For the seafood, season the salmon filet with salt and pepper. In a small pan, heat 1 cup of tomato sauce and 1/4 cup of white wine. Put the salmon filet in the sauce and cook on low heat with a lid on for 5 minutes. Add the clams, mussels and shrimp, put the lid on and cook another 5 minutes or until all clams and mussels have opened. Pour the soup with the fish and seafood in a shallow plates, garnish with parsley!